It is not easy to uncover new dimensions in such a frequently played, almost hackneyed work as Tchaikovsky's violin concerto. 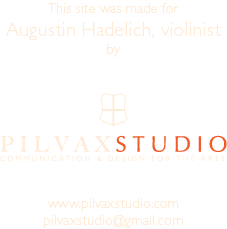 Augustin Hadelich succeeds in doing just that, thanks to his strong violinistic profile, characterised in large part by a focussed and radiant tone, highly refined musicianship and an impressive instrumental precision that he can summon up live. The recording of Lalo's folkily rousing 'Symphonie Espagnole' was also of a live concert performance. Here too, Hadelich showed himself to be a brilliant soloist, shaping his part with great intensity and dosing emotions with real control.